Lying has its benefits. It allows people to feel better about themselves, to make themselves look better in others’ eyes, and to maintain good relationships. At same time, lying can also create problems. Lying can be cognitively depleting, it can increase the risk that people will be punished, it can threaten people’s self-worth by preventing them from seeing themselves as “good” people, and it can generally erode trust in society. How do we know whether lying will generate positive consequences, negative consequences, or a mix of both? In our recent review article, we suggested that paying attention to why people tell lies can allow people to forecast the consequences of those lies. We examined specifically how lying out of concern for others, out of the desire for material gain, and out of the desire to maintain a positive self-concept can yield sometimes surprising positive and negative consequences that relate directly to the desires motivating the lies. 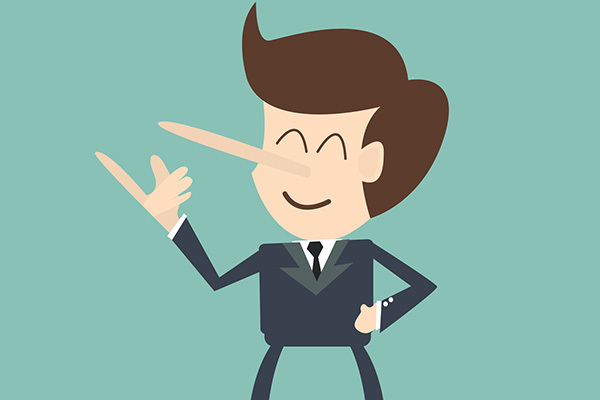 Because lying can create problems for the liar and being honest allows people to feel good about themselves, most of us tell the truth in most of our interactions. When we decide to lie, we privilege some other value over honesty. The value is often compassion, as people lie more about their feelings than about anything else. When people misrepresent how positively they feel about another person or something dear to another person, they build a connection with that person and avoid hurting that person’s feelings. As Levine and Schweitzer (2013, 2015) have found, those who tell prosocial lies are often viewed as more trustworthy and more moral than are people who tell harsh truths. Moreover, these prosocial lies let us form larger social networks than we could otherwise maintain. In contrast, lies not motivated by compassion constrain the size of social networks. However, not all prosocial lying driven by compassion yields benefits. People who receive overly positive feedback about their abilities are susceptible to thinking they will succeed in enterprises with very low chances of success and may therefore launch ill-advised ventures. Desire for material gain also motivates people to lie. When this desire motivates lying, the consequences are likely to be negative – not only for the person caught trying to deceive others but for other people. When people lie out of self-interest, their deceptive behavior becomes a social norm. Lying is socially contagious in that when people see the precedent that dishonesty is appropriate, they are more likely to lie themselves. However, not all lying is contagious. Although people emulate the dishonesty of those whom they consider to be in their “in-group,” they become less likely to lie when they observe out-group members being dishonest (Gino, Ayal, & Ariely, 2009). Not everyone will judge harshly people who lie out of desire for material gain. In some organizations, people will reward such deception because it can benefit colleagues and clients. As Pierce and Snyder (in press) demonstrated, employees who lie on behalf of customers are rewarded with greater financial gain and lower risk of termination. Their willingness to lie becomes social currency coveted by those who stand to benefit from their dishonesty. One factor that prevents people from lying for personal gain is the need/desire to see oneself as a moral person. Lying motivates people to rationalize and justify their lies to themselves, so that they may continue to see themselves as good. When people morally disengage from the situation by rationalizing their behavior, they set themselves up to lie more in the future because they have already found a way to justify dishonesty. Resultantly deception of one type can lead to other forms of deception. For example, people who were asked to wear counterfeit sunglasses came to feel as though they were inauthentic. Consequently, these people became more likely than those in a control condition to over-report their performances on subsequent tasks to earn money. Small initial lies may therefore yield escalating forms of dishonesty, which is concerning because monitors have more difficulty noticing and policing a slow erosion of ethics compared to abrupt moral degradation. Dishonesty motivated by desire for personal gain can also lead people to forget the rules that are intended to govern their behavior. As Shu and Gino (2012) have shown, people who lie will sometimes forget rules about lying while remembering other sorts of details. Additionally, liars may present themselves as virtuous by condemning others for the same types of deception that they themselves perpetrated. Fortunately, self-interested deception does not always result in further deception. People will sometimes morally compensate for past dishonesty through prosocial actions or justifications for their behavior (e.g. Jordan, Mullen, Murnighan, 2011). People sometimes lie to themselves or others out of a need to see themselves positively. These efforts are sometimes successful, as people often experience greater positive emotions when exaggerating their intelligence or skill to themselves or others. As Ruedy, Moore, Gino, and Schweitzer (2013) have shown, people may also experience a duper’s delight or cheater’s high when they feel they have gotten away with deception. Furthermore, because cheating takes people out of a rule-following mindset, it can stimulate creativity by allowing them to combine previously unconnected ideas (Gino & Wiltermuth, 2014). Deception intended to bolster the ego is not costless. Liars driven by the desire to see themselves positively can forget that their dishonesty contributed to their success. Consequently, they may make misguided bets about their future performance (Chance, Norton, Gino, & Ariely, 2011). The consequences of lying are not as simple as they might seem. People often think that lies breed contempt and guilt, but they do much more. They foster relationships, build trust, destroy social networks, create social networks, make people more creative, and influence how often other people lie. We have argued in our review article that understanding why people lie goes a long way in predicting which of these consequences result from dishonesty. Levine EE, Schweitzer ME: Are liars ethical? On the tension between benevolence and honesty. Journal of Experimental Social Psychology 2014, 53:107-117. Pierce L, Snyder JA: Unethical demand and employee turnover. Journal of Business Ethics, forthcoming. Shu L, Gino F: Sweeping dishonesty under the rug: How unethical actions lead to forgetting of moral rules. Journal of Personality and Social Psychology 2012, 102:1164-1177. Jordan J, Mullen E, Murnighan JK: Striving for the moral self: The effects of recalling past moral actions on future moral behavior. Personality and Social Psychology Bulletin 2011, 37:701-713. Ruedy NE, Moore C, Gino F, Schweitzer ME: The cheater’s high: The unexpected affective benefits of unethical behavior. Journal of Personality and Social Psychology 2013, 105:531-548. Chance Z, Norton M, Gino F, Ariely D: Temporal view of the costs and benefits of self-deception. Proceedings of the National Academy of Sciences 2011, 108:15655-15659. Scott S. Wiltermuth (wiltermu@usc.edu) is an associate professor of management and organizations at the University of Southern California. He received his doctorate from Stanford University. He studies ethics and morality.His research also investigates how interpersonal dynamics, such as dominance and submissiveness, influence cooperation and coordination. David T. Newman (dtnewman@usc.edu) is a doctoral student in management and organization at the University of Southern California. He earned his B.A. in psychology from Yale University and his J.D. from Harvard Law School. His research interests include business ethics, the morality of technology, the pursuit of meaning, and the psychology of property and ownership. Prior to entering the Ph.D. program, David worked for EthicalSystems.org, a non-profit collaboration of researchers dedicated to the advancement of a systems approach to better business practices. Medha Raj (Medha.Raj.2018@marshall.usc.edu) is a doctoral student in Management and Organizations at the University of Southern California. She earned her A.B. from Dartmouth College, where she majored in Economics and minored in psychology. She studies interpersonal interaction with a focus on prosocial tendencies and behaviors. In some of her research, she studies the role of guilt-proneness, forgiveness, and prosocial lying in both interpersonal and organizational contexts.